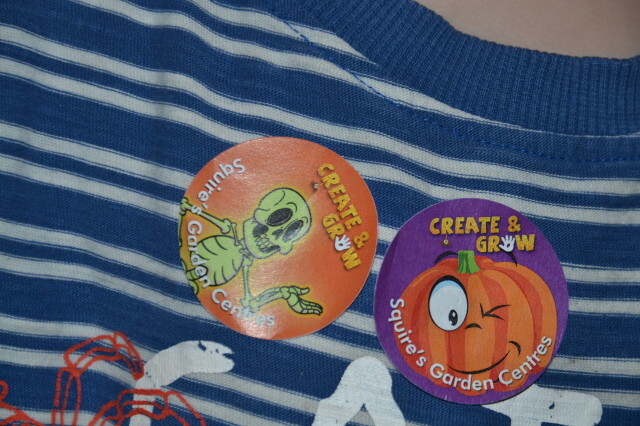 We just returned home after fun hour or so at our local Squire’s Garden Centre trying out their Create & Grow Spooky Half-Term Fun event before it opens to the public tomorrow. 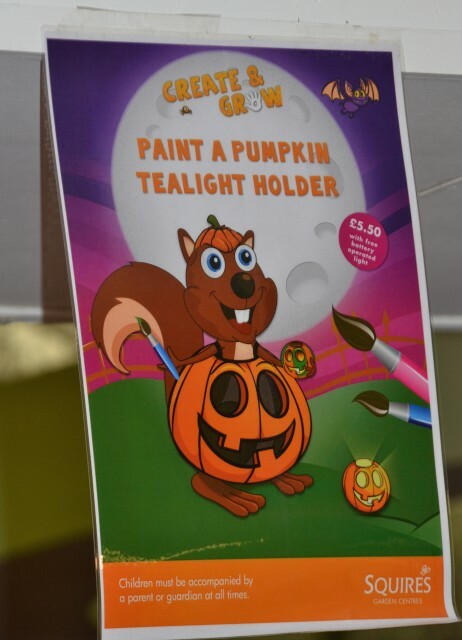 The fun drop in craft session and pumpkin pursuit are run at Squire’s Garden Centres ( excluding Chertsey ) from Monday 27 – Friday 31 October, between 10am – 4pm. 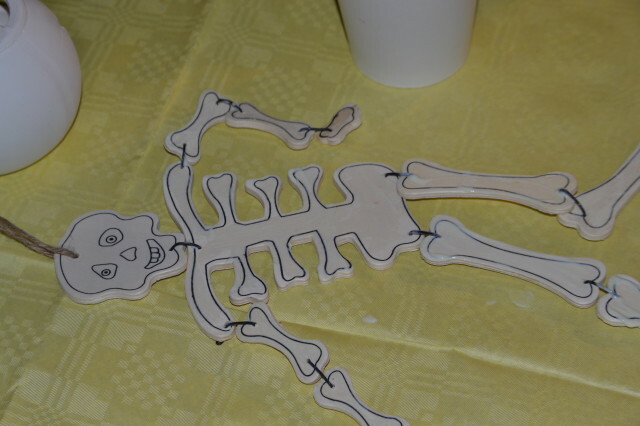 We painted terracotta pumpkin tea light holders and glow in the dark skeletons before hunting for clues around the centre to solve a puzzle, which if you complete you can collect a sticker. 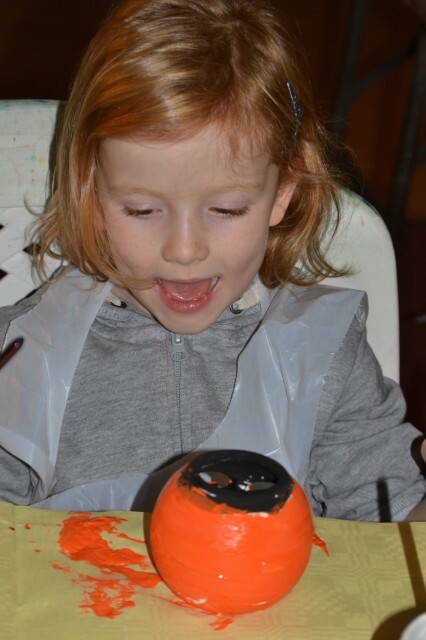 It was a really enjoyable couple of hours and a great way to have some easy, creative and spooky fun this half term. We couldn’t wait for it to get dark tonight to see our spooky skeletons glow and light our tea lights. Pumpkin tea light holders are available for a very reasonable £5.50 while the glow in the dark skeleton is £3.50. The pumpkin tea tight holders are very cute even when a bit smudged like ours. Aprons and paint are included, and the paint dries quickly so they’re not messy to take home. The skeleton is quite quick and easy to paint so would be great for even very young children, and the fact that it glows in the dark makes it extra special, we’re going to hang ours up facing outside on Halloween. I spotted some lovely foodie Christmas gifts as we hunted for clues, so will definitely be popping back to do some Christmas shopping, I do love a beautifully arranged jar of sweets. Badshot Lea also has an impressive toy collection, it’s definitely worth a good look around. Don’t forget to enter Squire’s creepy colouring competition while you’re there to be in with a chance of winning a Squire’s goodie bag (worth £20). 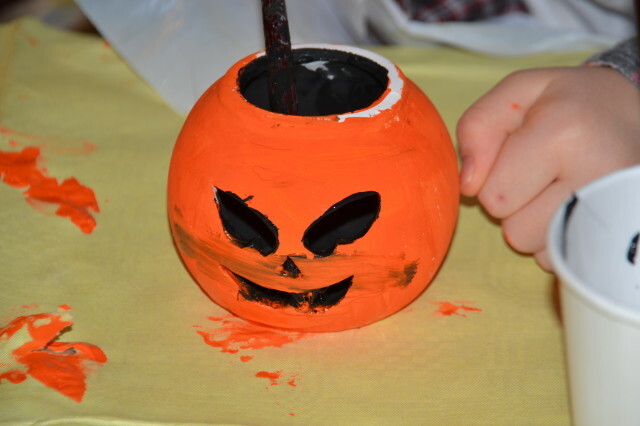 Create & Grow Spooky Half-Term Fun’ events are on a first come first served basis, while sticks last. Children must be accompanied by adults at all times. We were given three pumping tea lights and three skeletons to try out the event.